For example, every day in the north Indian city of Muzaffarnagar, a complex system goes into action, attempting to deal with the 120 tons of solid waste — glass, plastic, paper, food — generated by the city’s residents. Hundreds of waste collectors fan out across the city pedaling tricycle carts, which they fill with the refuse from approximately 50,000 households before taking it away to be treated or dumped. Meanwhile, informal waste workers such as kabadiwalas (scrap collectors) salvage recyclables and other valuable materials, which they sell to make their living. Finally, waste that goes uncollected is often dumped by the roadside or in bodies of water. Some variation of this largely ad hoc process occurs in dozens of cities across India, where solid waste management is a complex system of public, private, and informal players. 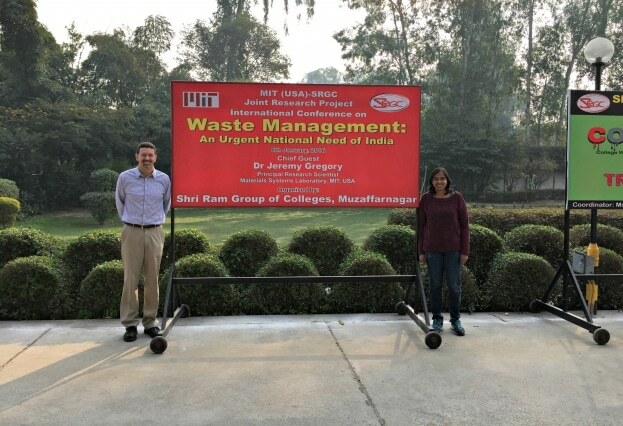 The decision-support tool being created at MIT will use a variety of parameters to optimize a waste management system and recommend strategies tailored to a city’s needs, factoring in all the dynamics of a city like Muzaffarnagar. They are using Muzaffarnagar as a pilot city, where they have conducted a “waste audit” of six neighborhoods at different socioeconomic levels. Perhaps their most exciting discovery was that roughly 60-70 percent of the total waste was organic — primarily food waste. Various methods exist for converting organic waste into valuable commodities; these methods include biogas production, composting, and pelletization. This creates the potential for cities and private companies to generate additional revenue while reducing the environmental stress of waste dumping. But to take advantage of it, different waste management strategies will be needed. Suggesting what those strategies could be is where the MIT tool comes in. The MIT team is not advocating any particular technology. Rather, they want to recommend the most appropriate solution for a specific context, including those that are still in the exploratory stage. “We want to add to our portfolio new technologies coming out of the Tata Center program,” Gregory says, citing a bioreactor being developed by Gregory Stephanopolous, the Willard Henry Dow Professor in Chemical Engineering at MIT, and a torrefaction reactor being developed by Ahmed Ghoniem, the Ronald C. Crane (1972) Professor in Mechanical Engineering at MIT. Their next step is to scale up their audit from those six neighborhoods to the entirety of Muzaffarnagar. Ultimately, they want to identify the key parameters that will make the GIS-based tool applicable across different urban typologies. “It’s not just about designing the system that costs the least,” Gregory says. “You can also design a waste system that encourages employment, social equality, or positive environmental impact. The team will return to Muzaffarnagar this summer to explore collection strategies, such as incentivizing households to segregate their food waste, and also to study the impact of municipal policies on waste generation in collaboration with local government and the Shri Ram Group of Colleges.